We handle exclusive lines of feed that are not available in other stores such as Godfrey’s Feeds. We sell their horse, goat, cattle, sheep/ lamb, chicken starter and layer feeds as well as other items we get from them. We have a full line of Reedy Fork Organic Feeds. We stock the Layer, Soy Free Layer, Scratch, Goat, Soy Free Goat, Hog Grower, Turkey grower and Alfalfa Pellets. We get by special order, anything else they have like Corn, Cracked Corn, Wheat, Oats, Barley, Duck Developer, Duck Layer, and Cow Feed. We buy all our Pet Foods direct from Sunshine Mills, we carry their brands. We have the Hunter’s Special and Sportsman’s Pride lines with anything from an inexpensive 21% protein - 8% fat variety all the way up to a Limited Ingredient 26% protein – 18% fat and everything in between. We stock the Triumph in the Premium Chicken, Rice and Oatmeal, Super Premium Lamb & Rice, Chicken & Rice, and Beef & Barley and Grain Free in Salmon & Sweet Potato, Turkey, Pea and Sweet Potato, and Duck, Chickpea and Sweet Potato. We stock Grain Free Jerky Treats, Pig Ears, Basted Rib Bones and other healthy treats for your dogs! We have the Evolve Cat and the Buttons and Bows Premium Cat Formula as well as a full selection of canned food for your dogs and cats! 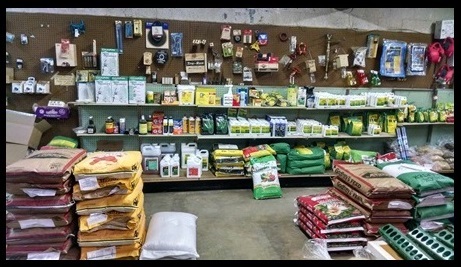 We have all you Lawn & Garden needs as well as bulk Heirloom Seeds and Heirloom (locally grown) garden vegetables. Bird Seed!! We have the very best Bird Seed prices in town! We have quite a selection as well! We have Hay, Straw, Grass Seed, erosion control, chicken wire, fencing supplies etc. Please come and see us first, if we do not have IT, we can either get IT for you or help you find IT, whatever IT is!